The Cumberland & Dumfriesshire Farmers Mart P.L.C. 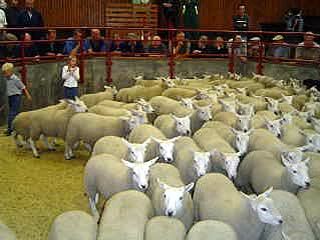 had forward 4,361 Store Lambs at their weekly sale at Longtown on Tuesday 31st August 2010. All classes easily maintained late high rates. Top of £70 and £68 for Texels from Greenknowe, others £64.80 East Murton, £64.50 Westhills; Hampshire £62 Arnmannoch; Greyface £61.50 Stonehall, £57.50 Bayldon, £57 Howburn; Suffolk £60 Timpendean and Borthwick Brae; Charollais £60 South View; Hill Cheviot £59.50 Catslackburn, £58 Kelsocleugh, £55 High Thorneyburn; Blackface £54 Auchengruith; Swaledale £40 Merryknowe. Ewe lambs to £70 for Texels from Greenknowe.